We have been selling Wheelchair Slippers for many years. They continue to be one of our best selling products. We get many positive emails from customers telling us how nice they are and how they help to keep the house clean. Then about a year ago, a customer asked us if we made water resistant Wheelchair Tire Covers for a swimming pool? We started investigating the issue and asking around. It seemed that many customers were interested in a wheelchair tire cover that would stand up to water. We were told that Wheelchair Slippers do a great job keeping dirt and marks from transferring to the floors and carpets. But what about mud? That got our creative minds thinking. It took about a year and a half of trial and error (and believe me, there was a lot of error) until we hit on just the right material. We tested different types of materials until we hit on one that worked best. In the end we created our newest wheelchair tire covers from non-porous neoprene. It is a type of neoprene which is stretchable so it can be pulled over the wheels and then holds on tightly and will not come off. These covers are tough and durable and yet they look nice too. We even had them tested by a Spanish company which has wheelchair accessible swimming pools. This company tested our covers for several months in chlorinated water and sent them back to us for inspection. The chlorine did not visibly damage or change the properties of the neoprene. With the right material in hand, it was a matter of finding a way of joining the ends together so that water does not leak from there either. 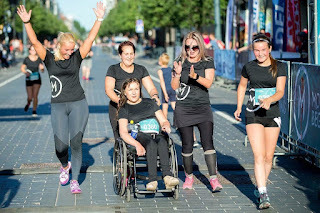 With the right material and the right design, RehaDesign Mud Eaters were born! 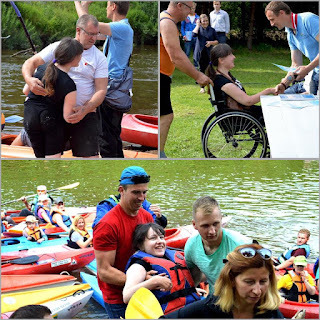 So, if you are using your wheelchair in a wet or muddy environment, or if you would like to take your wheelchair into a wet area such as a swimming pool, you would probably be interested to learn about RehaDesign Mud Eaters. Sadly, a few months ago, we read an article about a young girl in Georgia named Lexi Haas. 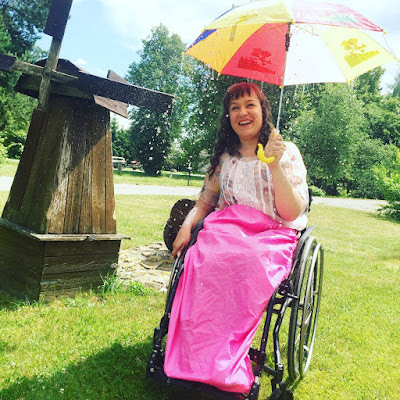 Lexi was rejected from entering a museum because her wheelchair would "get the carpet dirty". That decision caused the museum a great deal of embarrassment from the negative publicity it generated. It also cost the staff member her job. What a pity for everyone involved. The solution is now obvious, but how can we tell the museums and swimming pools of the world about Mud Eaters? Any suggestions?